Anaerobic digestion is a manure treatment system that produces biogas. There are many benefits of digestion such as reductions in: odor, pathogens, and greenhouse gases (climate change). Producing biogas from manure yields useful by-products. The economics of digestion are dependent on state energy policies and co-digestion of off-farm wastes to generate revenue. This virtual tour highlights the Cayuga County Soil & Water Conservation District regional digester. This facility receives manure from multiple dairy farms. The regional digester model allows smaller farms (not large enough to build their own digester) or large farms unwilling to take on the complex management of a digester to participate. How Does This Anaerobic Digester Work? The hydraulic mix or pressure differential digester type is common in Europe, but is unique in the United States. The video below explains how the material moves through the digester. Even though we refer to this facility as an “anaerobic digester” there are actually many pieces required to make this system work. The digester is one part. 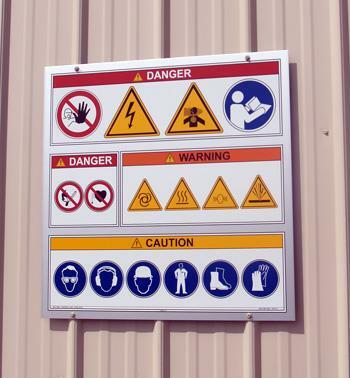 The presentation below works through the entire facility. The digester tank (photo above: left) has a capacity of one million gallons. It is estimated that 40-43,000 gallons will be added to the digester per day when it reaches full production capacity. 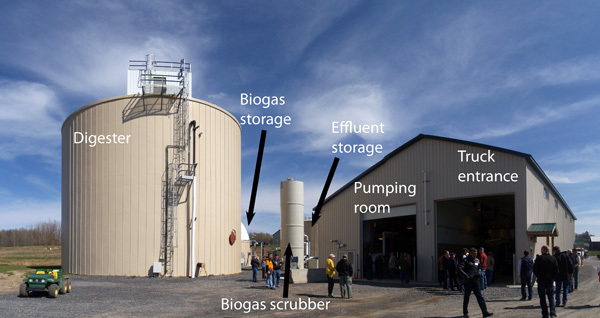 The trucks carrying raw (undigested) manure from the farms enter on the right side of the building (photo above:right) and the manure is pumped into a holding tank (not visible in photo) and mixed with food waste. This digester has been in the news as the price of power has dropped and the financial side of the operation less viable. A big thank you goes to the Cornell University dairy manure management team for organizing the 2012 “Got Manure?” conference that included a real life tour on which we were able to obtain the media for this virtual tour. Next PostNext What is the amount of carbon dioxide (CO2) per pound of coal compared to pound of wood that is released into the air when each is burned?